After discussing 5 reasons why Bitcoin price could surge on Saturday, the world’s largest virtual currency by market cap rallied more than 11 percent on Monday as Tether, a token designed to be pegged to the US dollar, dropped more than 2 percent. The price recovered above $6,900 level around 8:00 GMT for the first time after a major sell-off. According to data from CoinMarketCap, Bitcoin reached a market capitalization of $115 Billion after the price rallied with 24 hours volume of $821.01Million. The price of the three biggest digital currencies, Bitcoin, Ethereum and Ripple all jumped collectively by 11 percent higher. 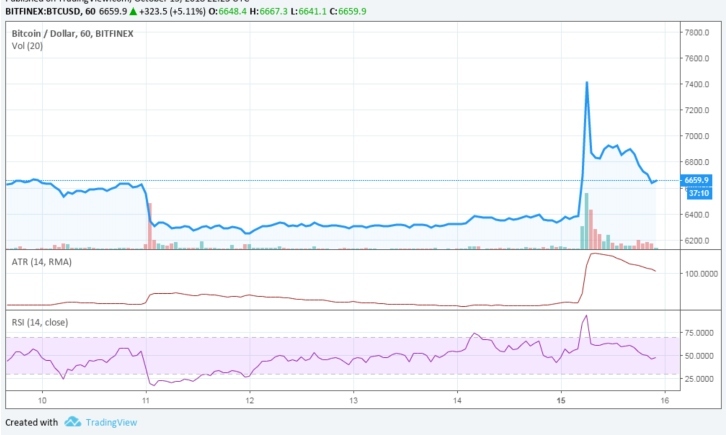 The sudden rise in Bitcoin price was triggered by a sell-off of Tether (USDT). The sell-off dragged the price of the stable coin down by around 6 percent towards $0.94 on Monday morning. The sudden drop in the value of Tether created a premium on Tether-integrated cryptocurrency exchanges. Moreover, Bitcoin is being traded with a significant premium on platforms such as OKEx and Huobi that have recently integrated USDT. We are working to implement a new and increasingly robust fiat deposit system to be available in the next 24 hours, by Tuesday, October 16, 2018, to allow for the efficient processing of fiat deposits. Until then, we apologize for the inconvenience of the situation. Meanwhile, some have claimed that the price surge was not caused by the Tether sell-off. Rather, they believe that it was as a result of algorithms in Asia with large cash injections. It is also believed that these cash injections are the very reason why Tether is has performed poorly. While there are still quite a few things to be explained regarding the current situation, the truth is that a lot of retail investors seems not to be bothered about the reasons behind the price surge. During the past few trading hours, Bitcoin broke the $7,000 mark as the cryptocurrency market recovered. The digital coin added about $20 million into the market value. Bitcoin has corrected to trade around the $6,666 mark, with USDT premiums on Bitfinex exchange keeping the price at around the $7,400 mark. Bitcoin price rally was up to $7,200, marking a 12% increase at the height of the recovery. The price is currently up by 5.12% over the past 24 hours. The Bitcoin price was trading in a closed space over the past month and it was unable to go past the $6,600 zone. This indeed was a crucial resistance level for Bitcoin, with multiple rebounds over the past month. A new resistance was formed at $6,950 mark after the sudden surge. The weekly charts show that the 100 SMA line is far above the 200 SMA line which suggests that the path of least resistance is to the upside. That is to say, the bullish rally is more likely to resume than to reverse. Nevertheless, StochRSI and CCI indicators in daily time-frame look ready to move downwards after coming close to overbought levels. However, if Bitcoin can surpass the $7,300 monthly resistance level in the short-term, it will become possible for the BTCUSD pair to initiate a long-awaited price rally. If the price fails to breakout of a major resistance level, then there exists a possibility that it might struggle to maintain momentum and slide towards the $6,200 level.